If properly made this cake will be very soft like sponge. It is very light and a little moist. Preheat the oven to 350˚F (180˚C). Sift the flour, baking powder, soda and salt without lumps. Add sugar to the butter and beat till it becomes fluffy. Whip the eggs separately (that is the white and yolk separately) and add the yellow portion slowly to the butter sugar mixture. The white portion of the egg should be added to the flour later. If condensed milk is used in place of eggs then add condensed milk. Add the essence also. Whip thoroughly till the entire mixture becomes soft. Add to this as well as the white of the eggs alternatively to the sifted flour and fold well. After mixing well, pour the batter into a greased baking tin and bake for 30 to 45 minutes. 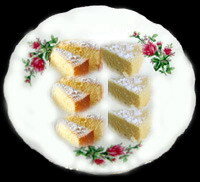 Ensure the completeness of baking through needle test and then invert on a plate after it is cooled. Spread some caster sugar over the top to stick to it. Refrigerate. Cut into convenient pieces to serve. Preheat the oven to 350˚F (180˚C). Sift the flour, baking powder and salt without lumps. Cut each cherry into four pieces and mix with the sifted flour. Add sugar to the butter and beat till it becomes fluffy. Pour each egg separately to this and whisk well after each egg is poured. If condensed milk is used you can slowly add and simultaneously whip. Add the sifted flour without lumps slowly and fold. After mixing thoroughly add vanilla essence too and mix well. Pour this into greased baking vessel and bake for 30 to 45 minutes or till it bakes well (test by needle). As usual, invert on a plate when cold and refrigerate. Cut into convenient pieces to serve. 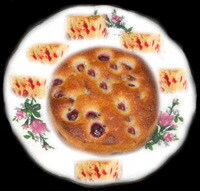 This entry was posted on October 13, 2012 at 8:15 pm and is filed under Puddings and Cakes with tags all purpose flour, American sponge cake, baking powder, baking soda, butter, cake, caster sugar, cherry, Cherry cake, condensed milk, egg, Eggless cake, maida, salt, vanilla essence. You can follow any responses to this entry through the RSS 2.0 feed. Both comments and pings are currently closed.